Omkara:When I saw you first itself I felt a strange connection with you.Later I realized that I am falling for you.I love you Gauri. Om:You know our family too wants us to unite. Om:Gauri… I want to spent the rest of my life with you.Will you marry me? Om moved closer to her ears:Gauri.please say..will you be my life partner? Gauri:Omkaraji…to say the truth..I have ever see you that way.I can’t say that I love you. Om felt upset.His eyes became wet. Om:It’s ok Gauri.I won’t force you to love me or marry me.I am not lucky enough to have a pure soul like you in my life.It’s my fate and I am willing to accept my fate.Don’t worry.Your reply won’t change our relationship.I am not angry with you.I wish you all the best. He turned to walk off. But suddenly Gauri held his hand. Gauri:You don’t want to hear the whole thing?I need to say more.You did’nt let me complete my words. Om turned back and looked at her. Gauri:I may not be loving you passionately.But now for me love is trust and the truth is that you are the person I trust the most in my life.If you want to marry me,I am the most luckiest person in this world.How can I reject you?I will marry you happily.And I am sure that after marriage I will fall in love with you as you will be the most loving husband in this world. Om could’nt believe his ears:Gauri! They held each others hands and smiled at each other emotionally. The private investigator Abhishek rang up Tej. Tej:Did you get full information about Gauri Kumari Sharma? PI:Yes Sir.There is nothing abnormal or suspicious about her .Everything is normal.Whatever she told about herself seems to be true according to the investigation. Jhanvi brought tea for both of them:Your private detective enquired about Gauri? Jhanvi:Did he say anything bad about her like you suspected? Tej:No.He said there is nothing suspicious about Gauri. Jhanvi:See..we all told you that Gauri is a nice girl.But you always refused to believe it. Tej:May be I was wrong. Jhanvi:Hope now you won’t have any problem with Om marrying Gauri. They both sipped tea together with a smile. Anika and Soumya went near her. Anika:Gauri..there is a surprise for you. Soumya:Yes.Bade baalon wala bhaiyya is giving you surprise always. Gauri blushed.They took her to the drawing room ad she was surprised to see her mother there near Omkara. Gauri ran towards her and hugged her:Maa! Her mother caressed her:Gauri…I am very happy for you. Om:Today onwards your mother will stay with us as your mother is my mother too. Gauri smiled emotionally:Omkaraji..this is the most beautiful surprise given by you.Thank you very much. Gauri’s mother:I am happy that Sankarji gave the best boy to my daughter. Omkara was walking.Suddenly he bumped into Gauri.His hard chest crushed her unknowingly making her fall.With losing balance he too fell along with her.He landed up on top of her.Their eyes got locked o to each other with burning passion. Unknowingly he leaned towards her face with his lips.She closed her eyes. Ban Gaye, Silsile.. (Mickey Virus). Suddenly they heard Kalyani’s voice and got up from the floor.Om and Gauri were shy to face each other.They both went to their room. Om was blushing thinking of the romantic moment they shared with each other.Gauri thought of their intimate moment. Gauri:I did’nt resist when Omkaraji came closer to me.I let him come closer to me.My heart too longed for it?It means I am falling for Omkaraji? She thought of her moments with Omkara. Shivay was in the balcony.He caught the grills.The grills broke easily as they were loose and Shivay slipped down.He screamed holding the edge of the balcony with his body floating in the air.Gauri who passed by saw it with a shock. Shivay:Gauri…anytime my hand will get loosen and I will fall down. Gauri:No Shivay bhaiyya.Nothing will happen to you. She extended her hand towards him:Catch ,my hand and come up.You can do it. Shivay tried to hold her hand and finally caught her hand.Gauri struggled hard to pull him because of his weight.After a lot of struggle she pulled him inside.They both were relieved.They sweated a lot. Gauri made him sit on the bed and gave him a glass of water. Gauri:Relax Shivay bhaiyya.Now you are safe.Shankarji saved you. Shivay:You are my savior Gauri.I can’t thank you enough. They had an emotional hug. Gauri:Good that you all came.Shivay bhaiyya overcame a dangerous accident. Kalyani:What am I hearing?My Billu! Shivay explained the situation.All were shocked. Kalyani:Billu..really God sent Gauri to save you. Shivay:Yes,I am alive only because of Gauri. Anika:Thank God…I would have died if something had happened with you. Anika:I told you that the grill’s condition in the balcony is bad.Then why did you go there? Shivay:I just went there to check how worse it is. Om:Anyways without any delay today itself it has to be furnished. 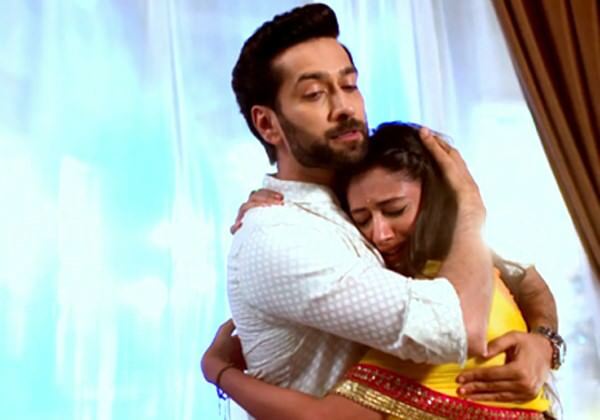 Anika hugged Gauri:Thank you Gauri,You proved that you are Shivay’s sister. Om looked at Gauri emotionally:Gauri…now I am proud of my decision to marry you.I won’t get a better girl in my life. Gauri smiled looking at him. Tej:Till now I was hesitant to accept you whole heartedly .But now I am happy that my son chose the best girl for himself. Kalyani:You are the best we could get Gauri. Shakti:We don’t have words to thank you for saving our son. Pinky held her hand emotionally:I always turned off my face seeing you.Now now my Maata showed me how wrong I was.I am sorry for ignoring you.Thank you so much Gauri for saving my son. Rudra:But Gauri..you are a surprise package.How did you get the power and strength to pull Shivay bhaiyya up like a police woman? Gauri gave him a pale smile. Soumya:Stop joking Rudra.Be serious sometimes. The engagement preparations started in the Oberoi Mansion. There is a middle aged man sitting on the chair with attitude.His cruel eyes ca scare anyone.He is none other than Kaali Thakur. Kaali:Gauri..don’t think that if you stay in Oberoi Mansion I won’t know what is happening in your life.Because I am not a fool.My eyes are always on you. He laughed in an evil manner. Kaali:I know how to bring you out of Oberoi Mansion. rikara and shivri scenes are awesome..engagement preparations started..wow..will be waiting for the next..